Oh, how cute! 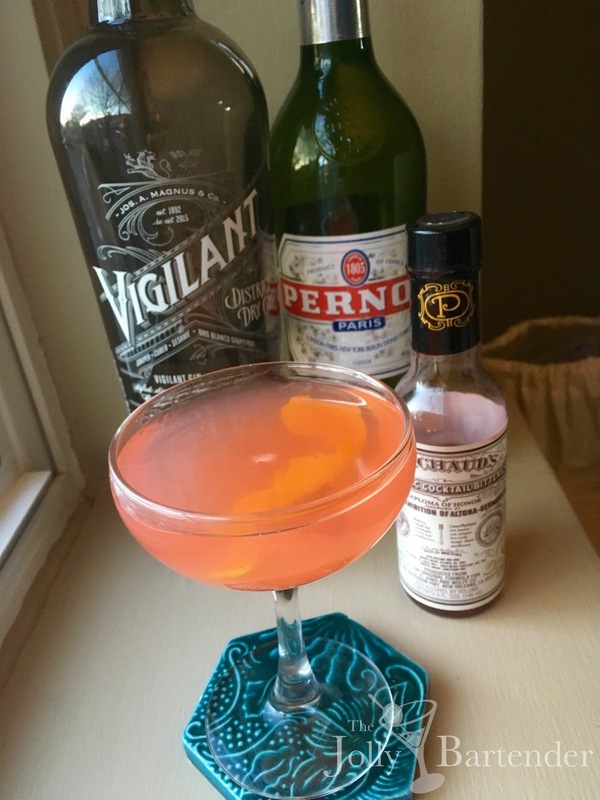 This drink is pink--with bitters. Such a dry and herbal bitter cocktail deserves to be named after a widow. Vigilant gin is an intense botanical lift to any cocktail. I also used the last of my Mancino vermouth with its 22 botanicals, so there's plenty of herbs and spice here. Then add Pernod for its anise and herbal flavor and Peychaud's bitters--three to five dashes means all five for me--and you get a pink color and citrus and absinthe herbal bitter notes. The effect is a drink that looks sweet but knocks you out with the first sip. Combine all ingredients except lemon twist in a shaker with ice. Shake and strain into a chilled cocktail glass. Garnish with lemon twist.